CBGBs. Before the "Save CBGBs" campaign. Before it closed down. And, well before it became just a club for bands to play on the same stage that their idols had played. I'm talking CBGB's in its prime, the glory days. Remember those? Think back to the days when The Ramones, The Velvet Underground, Blondie, Talking Heads, and Television ­ to just name a few ­ got their start on that dirty, cockroach-infested stage in the Lower East Side, on Bowery, the stage that spawned the 70s U.S. punk movement. Remember that and then let's talk about Portland, Oregon's New York Rifles. 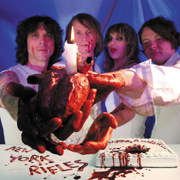 While not "punk" in the genre-labeling sense, New York Rifles are rock 'n' roll, with a punk heart beating ferociously, and play rock 'n' roll like it was played on that very CBGB's stage. This is wild, unabashed, melodic but still biting rock, with youthful energy that commands your ears to listen because you know you're hearing something straight from the soul, impassioned and meaningful from those that wrote it and are playing it for you. And, so, you walk away from that with something. A feeling that music isn't homogenized or laboratory perfected. No, you walk away with a feeling that music is alive and well, thriving in the blood of those that pull out their vinyl record collection. Sitting on their floors with the headphones, and cranking away the classics, without irony or pretense, just because it's a warm, Saturday afternoon and there is nothing better they'd like to be doing. "Make A Wish" by the New York Rifles embodies those old records, the spirit, the drive, the power and stamina. Think loud guitars, melodic shards crashing against punk-infused, sweaty rock 'n' roll. Sincere, honest vocals conveying equally sincere lyrics about every day life, whether it is love, heartbreak, lust, or just waking up in the morning and finding your direction that day. This is rock 'n' roll. This is New York Rifles. And, "Make A Wish" embodies it all.